If you order 10 or more, we sell them for $4.25 each This is a red key-ring type kit containing a CPR breathing barrier with one-way valve. All orders include free shipping. 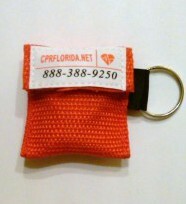 These cpr keychains are red, made of durable nylon and are highly effective in preventing disease transmission. These are about 2 by 2 inches and are great for coaches, counselors, teachers, personal trainers, athletic trainers, child care staff, childcare workers, recreation center staff and medical and healthcare professionals. 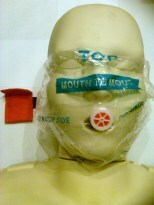 It makes taking action easy when you need to do cpr and give mouth to mouth breaths. Buy a few today and put them in your first aid kit, or attach to your work lanyard or keychain so everyone is ready to respond during a cpr and aed emergency with a cpr barrier device.